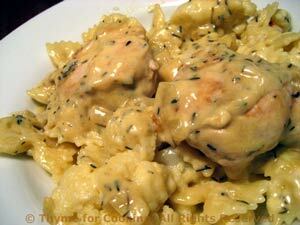 Chicken and Cauliflower Pasta, Thyme for Cooking's Healthy Weekly Menu. With leftover chicken this is almost too easy to be this delicious. The cauliflower cooks with the pasta, and the chicken and sauce cook in one skillet, saving on time and cleanup. Add thyme, mustard, wine, and stock. Stir to combine. For both: Dissolve cornstarch in chicken stock. Uncover, increase heat and add cornstarch. Stir until sauce is thickened. When water is boiling add pasta and cauliflower. Cook until both are done - assuming app. 11 minutes cooking time. If your pasta takes longer, wait a few minutes before adding the cauliflower.... or vice versa. To finish: Put cauliflower and pasta back into the pot. Add 1/2 cup of the sauce and toss to combine. Arrange pasta / cauliflower on platter, sprinkle with cheese. Lay chicken on top and serve, remaining sauce on the side.